Israeli settlers raid al-Aqsa and perform religious rituals, March 31, 2018. Photo credit: Wadi Hilweh Information Center. Israeli police arrested and assaulted Palestinians at the holy site. On Sunday, September 16, 2018, Israeli settlers raided al-Aqsa Mosque in Jerusalem under the protection of Israeli police. The settlers performed religious rituals at the compound in violation of the status quo agreement between Israel and Jordan that governs the site. As the settlers marched around al-Aqsa and the Old City, Israeli police stopped Palestinians in the streets and closed roads to them. 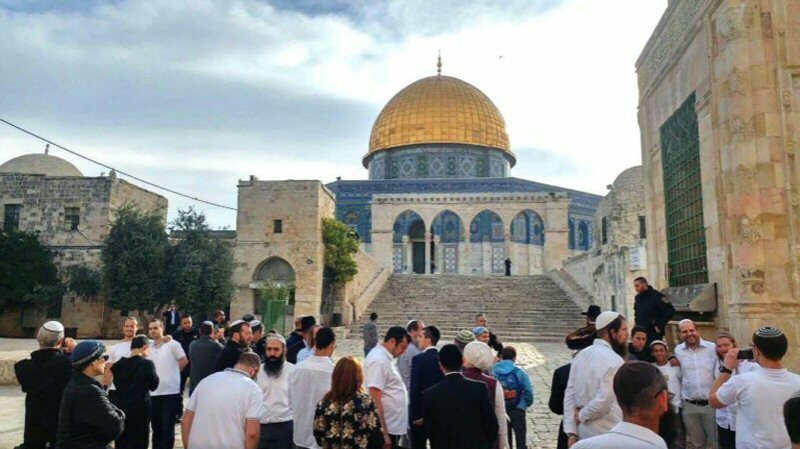 Israeli settlers continued to raid al-Aqsa and perform religious rituals there through the week, including on Monday, September 17, Tuesday, September 18, and Wednesday, September 19. Settler organizations, such as the Temple Institute, coordinated the raids for the occasion of the Jewish holiday of Yom Kippur, which took place on Wednesday. Israeli police were especially aggressive towards Palestinian worshippers on Tuesday. As the settlers raided the site, police assaulted Palestinians inside the holy compound. Five people were detained and four others required hospitalization, reports WAFA. On both Tuesday and Wednesday hundreds of Israeli police were stationed at the gates leading to the Old City, where they installed cement blocks. Israeli police erected flying checkpoints and instituted road closures in the Palestinian neighborhoods of Issawiya, Jabal al-Mukkaber, Sur Bahr and Umm Toba. After being arrested near al-Aqsa in the Old City, seven Palestinians were released from Israeli detention on Tuesday under the condition that they abide by a four-day ban from the Old City. Two of the seven Palestinians who were released are employees of the Islamic Waqf, the Jordanian body that oversees the site. Hamza al-Nabali. Photo credit: Wadi Hilweh Information Center. The following day, on Thursday, September 20, Israeli authorities banned Zeinat Abu Sbeih, the head of al-Aqsa’s female Waqf guards, from the holy site for 10 days. Another Waqf guard, Hamza al-Nabali, was arrested en route to the mosque and subsequently banned from it for two weeks.